IN CALM WATER. A splendid illustration of the new P. & O. liner Strathmore. Built by Vickers-Armstrong, Ltd, at Barrow-in-Furness, Lancashire, this ship was launched on April 4, 1935. Her overall length is 665 feet, breadth 84 feet, and draught 30 feet, and she is of 23,428 tons cross On her maiden voyage to Bombay, the Strathmore captured the Blue Riband of the passage from Mediterranean ports to India. 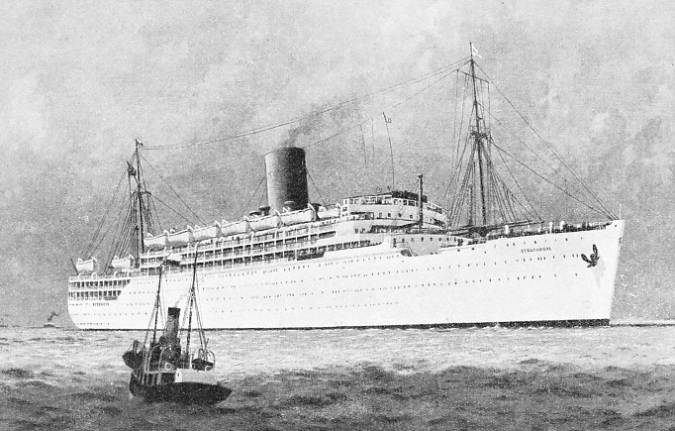 THE Peninsular and Oriental Company’s latest and largest liner, Strathmore, is a good example of the mail and passenger line class. She may therefore be regarded as the most modern development of that particular type of vessel for Far-Eastern and Australian trades via Suez. All ships intended for the Suez route have to conform in size and other details to the limitations imposed upon them by the passage through the Suez Canal. Even apart from this consideration, the most favoured size and speed of liners all over the world outside the North Atlantic trade is up to about 22,000 or 25,000 tons and twenty knots. The Strathmore is representative of the latest and best in that class. Built and engined by Vickers-Armstrong, Ltd, at Barrow-in-Furness, Lancashire, the ship was launched on April 4, 1935, by H.R.H. the Duchess of York, and was completed in September of the same year. This was a remarkably fast piece of work for a vessel so fine, large and luxuriously equipped as was the Strathmore. Her overall length is 665 feet, breadth 84 feet, and draught 30 feet, and she is of 23,428 tons gross and 28,700 tons displace-ment. She has twin screws, each driven by a set of turbine engines through single-reduction gearing developing a shaft-horse-power of 24,000, designed to give her a contracted speed of twenty knots, but found capable of exceeding this with ease. On her speed trials she attained a mean speed of 21·91 knots over the Skelmorlie measured mile on the Clyde, and a maximum of 22·277 knots. The complement of 1,625 is made up of 445 first-class, 665 tourist-class passengers, and a crew of 515, including officers. In addition to the commander, staff commander and six navigating officers there are, also ranking as officers, three wireless operators, twenty-three engineers, including electricians, two surgeons, two nursing sisters, one dispenser, and one hospital attendant. Officers of the purser’s department are chief purser, deputy purser, two assistant pursers and three purser’s clerks. On her maiden voyage to Bombay the Strathmore brought back to this country the Blue Biband of the run from Europe to India. She took exactly ten days from Marseilles to Bombay, against the record of eleven days previously held by an Italian liner. After she had passed through the Suez Canal the Strathmore made an average of 20·56 knots from Suez to Bombay. As with, most passenger liners - again outside the North Atlantic trade - the Strathmore has been designed and equipped to give the maximum of comfort to passengers through all the variations of temperature between the extremes of a European winter and a tropical summer. Cargo space includes insulated chambers suitable for the carriage of fruit, meat and other perishable goods over long passages. The ship has eight decks for the accommodation of passengers. 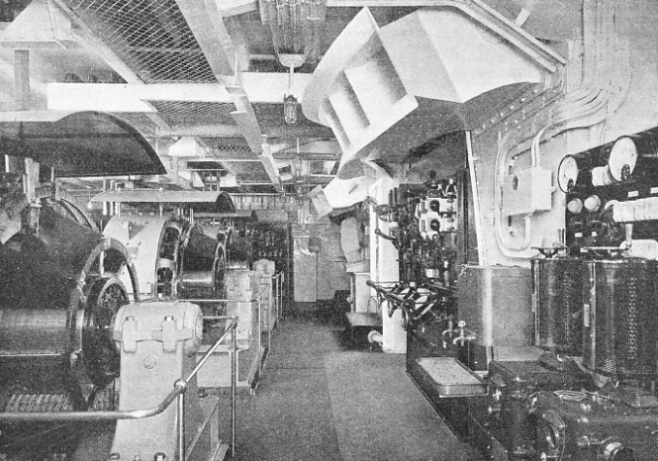 These are lettered downward from A to H, and it may best convey a sense of the lay-out of the accommodation to describe these decks in turn from forward to aft. “A” deck is the deck that the older generation of sea-goers still insist on describing as the “boat deck”, because along the sides of it are ranged most of the ship’s lifeboats. But here the boats may be said to occupy a minor or inconspicuous place. They are suspended on curved patent davits high enough above the deck to leave the greater space free for sports and games and their onlookers. The total of twenty-four lifeboats carried includes six “nested” and two power-driven by 4-cylinder diesel engines developing 36 bhp at 1,000 revolutions. All boats measure about 31 feet length, 10 feet beam and 4 feet depth, the power-boats having a capacity of sixty persons and the others of eighty-five each - 1990 in all, or nearly 400 more than a full ship’s company. In addition there are nineteen large life-rafts. In trials over the measured mile, the engined boats, fully loaded, maintained an average speed of over eight knots out and home. These boats would act as tugs, each one towing a line of the non-powered boats. The boat-lowering gear consists of eighteen sets of gravity davits, each driven by an electric motor, those for the lifeboats being of 35 hp and for the others of 15 hp. There are two main features which catch the eye of most passengers when they look along A Deck. One is the unusually large sweep of clear and unencumbered space available for games - an area of 275 feet long by 84 feet wide, this including a netted-in tennis court. The other is the single funnel towering over the central deck-house, on the roof of which is a cluster of strange-looking objects for ventilation and air-conditioning. This new fashion of a single funnel is likely to become popular in liners because of the greater free deck space it allows. Items of the deck equipment, slight in themselves, are yet significant of the thought given to every detail of comfort and convenience. Such, for example, are the faucets with iced water “on tap”. Right at the forward end of A Deck rises the “block” of the bridge deck and houses - the chart-room, wireless cabin, captain’s cabin., officers’ cabins, and, over all, the “flying bridge”, or, “monkey island”, from which the navigating officers have a clear view all round. This part of the ship is packed with innumerable devices, each of which plays an important part in navigation and in insuring the liner’s safety. The wireless installation is the latest Marconi type with two-kilowatt transmitter for long, medium and short wavelengths and additional units for reducing interference and “boosting up” weak signals. A Marconi direction-finder is installed with fixed frame aerial; and there is also an emergency set working from independent power. LOVERS OF SPORT are well catered for in the Strathmore, with her unusual amount of clear space on the A or “boat” deck. The area available for games is 275 feet long by 84 feet wide. This large space is partly due to the Strathmore having only one funnel. The lifeboats are suspended on patent curved davits high above the deck, thus allowing more room for the passengers. Another Marconi apparatus is the latest type of depth-sounding machine which shows visually to the navigator the depth of water under his ship. The instrument sends its signal in the form of a beam straight down from the bottom of the ship to the sea bed, whence it is reflected back again to a fitting in the hull which acts as transmitter and receiver. Receiving sets and loudspeakers installed throughout the ship on the decks and in saloons and lounges distribute news and wireless broadcast programmes or carry the music of the ship’s, own orchestra in any direction required. An installation for fire-detection is fitted in the holds and in other lock-up spaces that cannot be patrolled. In the wheelhouse is a glass-fronted case containing a cluster of funnel mouths. The presence of smoke in any part of the ship’s holds is immediately shown by smoke drifting from the numbered tube revealing the fire’s whereabouts, and also by the sounding of a gong that calls urgent attention to the danger. The Strathmore is one of the first ships to carry this audible alarm in conjunction with the smoke-detecting device. As a further protection against fire, in this instance, in the cabins an automatic sprinkler fire-extinguishing system is fitted. This likewise gives visual and audible alarm on the bridge. The system consists of a series of pipes filled with water under pressure, and with sprinkler-heads or valves set at intervals. The whole hull is divided into sections, each with its own set of pipes and sprinklers and automatic alarm. The slightest outbreak of fire brings the sprinklers into action and deluges that part with a rush of water. The Strathmore is one of a small but slowly increasing group of British vessels to be fitted with this device, although it has for some time been in use extensively on shore in large factories, stores and other buildings. 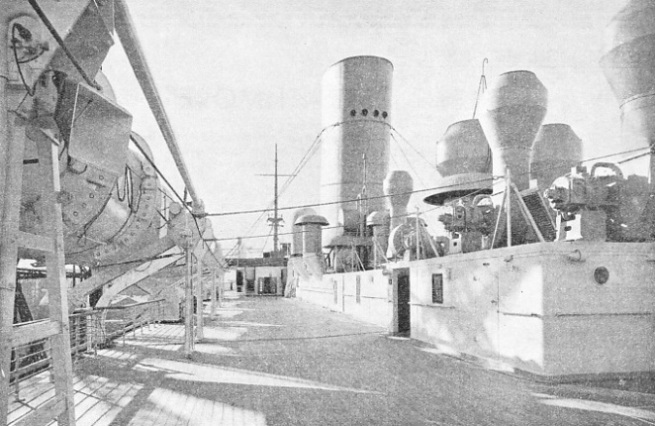 An additional protection in the ship is that all woodwork has been treated with a fire-resisting compound. The liner is thus as “fire-proof” a ship as has yet gone to sea. The Strathmore has also been made as nearly “unsinkable” as any ship afloat. The hull is divided by eleven transverse bulkheads rising to the level of F Deck, which is well above the normal water-line. A continuous double bottom runs the length of the ship from the forward or collision bulkhead to the after ends of the shaft tunnels. The double bottom is divided both lengthways and across so as to form a large number of compartments, some of these being used as tanks for fresh water, drinking water, water ballast and oil fuel. Further, a third of the hull amidships is protected by a double skin carried up to above the water-line level. ELECTRIC GENERATING PLANT in the engine-room of the Strathmore. The ship has twin screws each driven by a set of turbine engines through single-reduction gearing and developing a shaft-horse-power of 24,000. Designed for a speed of 20 knots, the Strathmore reached an average speed of 21·9, and a maximum of 22·277 knots on her trials. To the top right of the above picture can be seen the mouths of great ventilating ducts supplying air to the engine-room. B Deck, the second deck down, the promenade deck as most people call it, has a good wide walking space right round the superstructure. It is covered in by the deck above and has the forward end glassed in, so that even when the ship is running into a stiff breeze there is a cosily sheltered portion of deck with a view right forward over the bows. On B Deck are situated the public rooms - and here must come an apology to nautical readers for the use of such unseamanlike expressions as “rooms”, “walls”, and “staircases”. Such words as these, however, may be more readily understood than others such as bulkheads and companion ways. Besides, there are a number of parts and places in the ship, such as the children’s nursery and the passenger lifts, which are somewhat outside the range of the old ship vocabulary. Taking the public rooms in succession from forward, the Library and Writing Room comes first. This runs the width of the ship, except for the strip of promenade deck outside, and the forward wall is curved to follow the outline of the bridge front. To port and starboard are large bow windows carrying out the scheme of curvature. Fixed and loose writing tables are conveniently placed, and there are numerous easy chairs and settees conducive to restful reading. This room, with rows of extra seats, is used also for the cinema entertainments regularly given. Doors lead aft from the Library into a roomy Entrance Hall, with the main staircase and two passenger lifts leading to the decks below. From the Entrance Hall, doors of glass in silver metal frames open into the Lounge. This also runs across the width of the ship, except for the strip of promenade deck outside. A distinguishing feature is the beautiful panelling in Empire woods - finely figured Australian walnut, Canadian maple and bandings of Indian and Macassar hardwoods. The cool and restful colourings of the carpet and furnishing fabrics, the deep chairs and settees and low tables all convey a fitting note of “lounging”. The Dance Hall, farther aft, occupies an unusually large space, with the whole length of the sides enclosed by hinged and folding glass screens. These can be thrown open on to the promenade deck in hot weather; they can be closed and the whole room kept comfortably warm by the radiators when the ship is in the colder European waters. From the dancing space, vestibules open aft into the Veranda Cafe. This has large windows along the port and starboard sides, and a series of windows and double doors looking aft to heighten the veranda effect. An American bar runs across the forward end, and the colouring of rubber flooring and leather covered furniture is cheerfully bright and gay. The part of the promenade deck just outside the cafe looks down on the open Bathing Pool on C Deck, with a generous surrounding space provided with another cocktail bar and seats for sun-bathers. 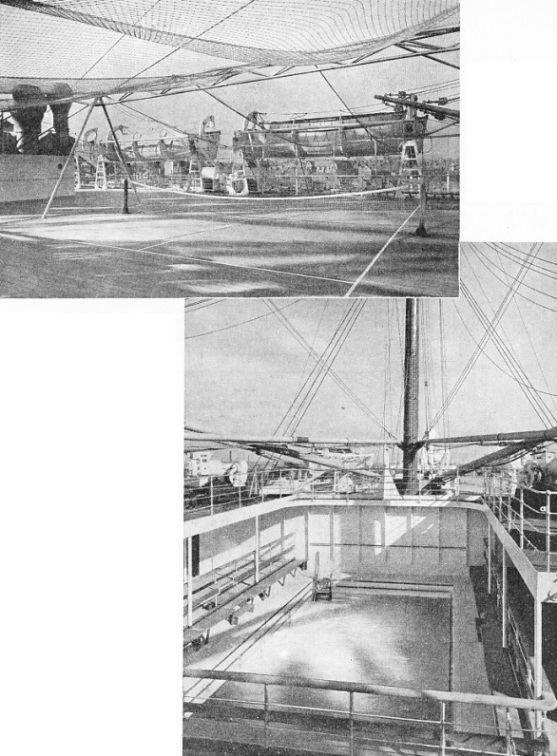 The decks just described are for the accommodation of first-class passengers, and occupy the whole of the block of the superstructure that is clearly seen in pictures of the ship to rise above more than a third of her entire length. C Deck is almost entirely given over to the first class. Taking it in sections from forward to aft again, the First-Class Nursery, with a wide play deck, stands well forward of the curved line of the bridge and A and B decks. The room is simply but brightly painted and furnished with gaily-patterned fabrics. Practically the whole middle section length of C and D Decks is given over to the first-class suites and cabins. These decks offer a great advantage in that the cabins are high enough above the water to permit the fitting of large windows. The windows can be kept open, if desired, even with a high sea running. Because they are so pleasantly situated, the cabins are naturally the most luxurious and the most expensive. There are two “Vice-Regal” suites, each with its own dining-room, sitting-room, bedroom, bathroom and private deck veranda; all rooms have communicating doors. The furnishings and fittings are of the most luxurious description. There are also six cabines-de-luxe, each having a bathroom and vestibule, and furnished with but little less luxury than the “Vice-Regal” suites. Many other single-berth cabins have their private bathrooms attached; and there are few of the first-class cabins without bathrooms which do not have these within a few yards’ walk along and across the alleyways. All cabins, single or double, have basins with running hot and cold water, and electric fires and ventilators to be switched on or off by the occupant. On C, D, and E Decks and the forward part of F Deck there are 190 single and 123 double-berth first-class cabins. 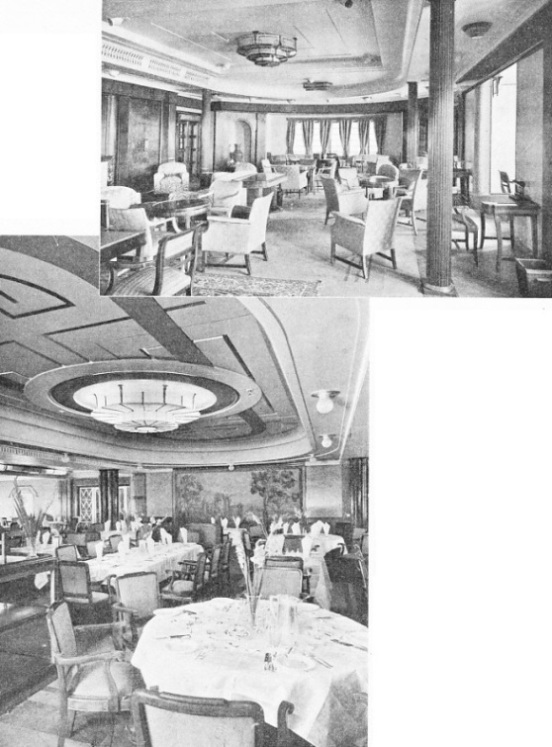 The first-class and tourist-class dining-rooms are both on F Deck, which is approximately midway down between the top deck and the bottom of the ship. In the old type of liner this would seem to be far down, and there may still be passengers who are “bad sailors” and who would shudder at the thought of going below in rough weather out of the fresh air which they believe is all that keeps them from succumbing to their weakness. In such a modern liner as the Strathmore this is an exploded myth. The dining-saloon is one of the steadiest parts of the ship because it is so centrally situated in the length and depth that the fore-and-aft pitch and the side-to-side roll are at their minimum. 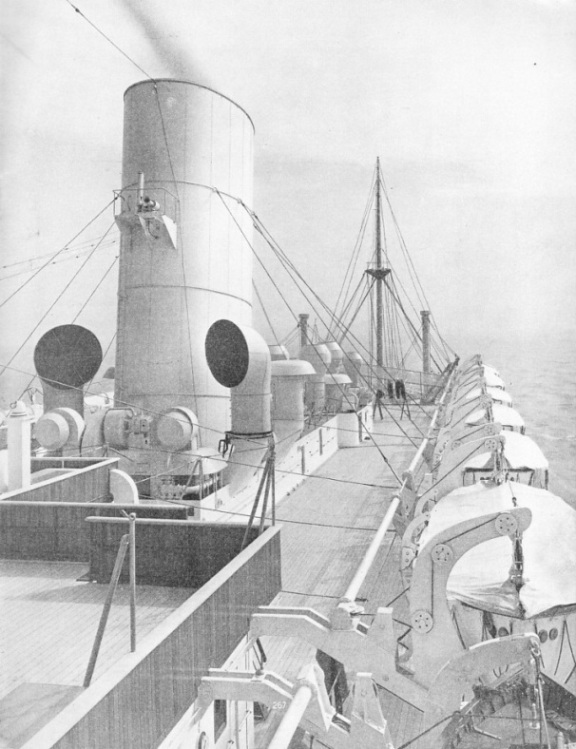 THE TOP DECK of the Strathmore showing some of the fine modern lifeboats carried by this liner. The twenty-four lifeboats include six “nested” and two power-driven by four-cylinder diesel engines. All boats have 31 feet length, 10 feet beam, and 4 feet depth. The power-driven boats can take sixty persons and the others eighty-five, giving a total of 1,990, or nearly 400 in excess of a full ship’s company. The boat-lowering gear consists of eighteen sets of gravity davits each driven by an electric motor. Science, too, has completely overcome all suggestion of closeness, stuffiness or lack of air as fresh as it is on the open deck. Because the saloon is “air-conditioned”, it is continually kept full of the freshest possible air, with the additional advantage that the air is warmed or cooled, dried or damped to the most pleasant and comfortable temperature and humidity, and all without the faintest suggestion of draughts. This is a new and important development available for all passenger liners to-day. The saloon is near enough to the waterline to make it necessary that, for strength and storm considerations, the port-holes should be widely spaced and strong - which means round and small port-holes, in contrast to the upper-deck windows. This difficulty is cleverly met by having outer port-holes to admit light to windows in an inner wall. The saloon measures 82 feet by 68 feet and has places for 258 people at separate tables with from two to a dozen seats. A dome is fitted at the centre to give the saloon additional height and a pleasant sense of spacious airiness. On the same deck as the first-class dining saloon, and separated from it only by the cooking galley or kitchen, is the tourist-class dining saloon. ON B DECK. A view of the comfortable Library and Writing Room, which extends practically the entire width of the ship. The room, with extra seating provided, can also be used for cinema shows. A section of the first-class dining saloon on F deck. The dining saloon is situated in one of the steadiest parts of the vessel, the ship’s movements here being at a minimum. The room, measuring 82 feet by 68 feet, can seat 258 people at one time. By an arrangement of “stepping” away the decks of the after end of the ship, it has been possible to give the windows in the saloon’s after wall a clear view out astern. These windows, with the port-holes along either side, can be opened to the air in warm weather. As in the first saloon, the tables are arranged to take small or fair-sized parties of from two to eight persons seated in comfortable arm chairs. The accommodation is for 332 people. Out of the saloon, wide stairways lead to the other decks; or continuing aft along the same deck we come to the Tourist Smoking Room. The modern tendency to give tourist passengers a standard of elegance and comfort little less luxuriant than in the first-class public rooms has been carried to an advanced stage in the Strathmore. It is not too much to say that the tourist passengers find a comfort and convenience, a catering to all their needs and wishes, and a beauty of decoration which no more than ten years ago would have been considered the last word in refinements in first class accommodation. Here it may be fitting to stress the whole principle of decoration that has been followed throughout the ship, especially because this makes a breakaway from a style that has become marked in modern ocean liners. Simplicity is the keynote. The “modernity” of a dozen years ago expressed in lavish marble pillars, Tudor fireplaces and period furnishing, which may suit an old mansion or inn ashore but not a ship at sea, has been dropped altogether. The other extreme of ultra-modern decorations and furniture has also been avoided. The effect of the whole scheme is of a quiet yet rich simplicity and restfulness which admirably fit such an ocean-going liner on the East-of-Suez run. The stepping arrangement already referred to gives the tourist part of the ship in the after end all the advantages of sun and air in good weather which the first-class passengers enjoy amidships. For example, on C Deck - which, as previously mentioned, is given over amidships to the best-placed bathroom cabins - the tourist-class passengers have their promenade and sports deck in the open air. On D Deck they have their dance hall which, similarly to the first-class hall, has its sides enclosed by hinged glass screens, allowing the hall to be closed against cold or wet, or opened to the fresh air and breeze in the hot days and moonlit warmth of tropical nights. Aft of the dancing space on this deck is the tourist veranda cafe, with another wide promenade space round outside it. Right in the after end of this deck is placed the “Sick Bay” - the surgery, dispensary, men’s and women’s “general hospital” wards - all of a standard which again is well in advance of the times. Continuing with the tourist accommodation, on the E Deck is the swimming pool, with plenty of room for bathers. Round it and round the large room of the lounge is another wide promenade space running to the stern. The room is beautifully panelled in sycamore and walnut, and is plentifully provided with small tables and comfortable chairs. On the same deck, but separated from the Lounge Deck House, is the tourist children’s nursery, attractively furnished and decorated. A passenger can make an entire voyage without seeing any indication of the engine-room, and almost without hearing the engines. The turbine engines run so smoothly and silently, except for an occasional high pitched whine caused by the reduction gearing, and with such a complete lack of vibration, that it is difficult to know when the ship is moving or lying at anchor. This freedom from vibration and engine noises is one of the most important contributory factors to the making of a “good sea boat”, and to the ease and comfort of passengers. TENNIS PLAYERS on board the Strathmore may keep in practice while on their voyage, a special netted-in tennis court being included on the A deck. This photograph shows the open bathing pool on C deck. The pool is provided with a wide surrounding space, cocktail bar and seats for sun-bathers.